Hello there fellow forum members, just introducing meself. 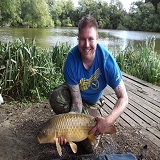 New to carp fishing, only ever caught one in me life that was accidental whilst float drifted into the margin and bait was troughed by a small carp which was reeled in to my astonishment.. Grew up in North Staffordshire and fished some lakes there as a lad, I now live in Scotland and have fished for trout with limited success, for the past few years have been fishing the big lochs for pike and been quite lucky, though my first (15lb) was Kinghorn loch, lucky or what! Kinghorn is my nearest venue, (discounting the Brickie) I learned there is dedicated carp fishing at Kinghorn and I am thinking why not? I have always thought of carping as a bit of a black art .. but going to give it a go.. I will be joining the SCG at the end of the year and become quite a regular there, looks good, work carried out etc by members, I spoke to one of you guys, I was there having a look - with the wife lol! Anyhow please forgive my "War an' Peace"
Blank smashed by an old leather mirror! !